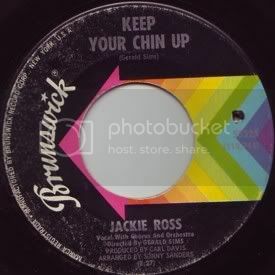 Here's a fantastic soul side by Jackie Ross on the Brunswick label, "Keep Your Chin Up". Jackie had a number of 45s released on the Chess label in the mid-60s before she moved to Brunswick for 2 45s, this one from '67, and one more in '68. This tune has had some plays on the northern soul scene, and really got under my skin when I participated in a CD swap last year. I knew I had to find this record, and my opportunity came last week when a copy was sitting in the cheap bins of a local shop. Right off the bat, "Keep Your Chin Up" gets me with the interplay of Jackie's high voice and the falsetto of the backing male vocals. From the opening guitar lines, the production really seems to do what is the song is all about, uplifting the spirits of someone who is helplessly in love. The drums, bass, bongos, even a vibraphone are there to propel the tune (there's a real lightness to the song when it's just these 4 instruments, never overpowering Jackie's vocals) to the chorus, where the strings and horns take the tune to a crescendo. And then guitar comes back in, everyone resets and we're off again. Brilliant stuff. You can hear this tune over at Soul Club. This is a great record. I love the sentiment--how often do you hear a girl telling a guy to hang in there?--and the sound of it is just wonderful. Thanks for writing about it! no surprise to see that Chicago soul pioneers Gerald Sims and Carl Davis are involved...every time i see the name Jackie Ross, i start to hear the opening lines of 'Selfish One' massive mod stomper from back in the day.